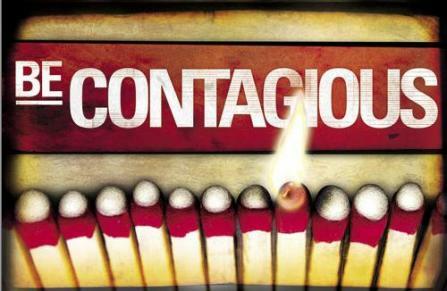 #121 – Positively Contagious – the funny way things work out. The last couple of weeks have been very interesting and maybe even enlightening for me – from my professional “world” right through the charitable “world” and into the world of training. It’s never a bad thing (entirely) – because there’s always something to be learned from the situation you’re in – but there are moments that just make you scratch your head and wonder. Unfortunately the stories are not even worthy of blogging about – but the results are; that’s where the magic happens. Professionally – on 3 different occasions this week I had just gotten finished talking about the health risks of sitting for long periods to groups and made sure to include the point that simply standing up on a regular basis could make a small, but meaningful difference. Each time, at that very moment, someone had the courage to stand up…..as if to say – “I’m not going to just sit there now that I know that”…..and others followed. As more and more people stood and it transitioned from “safe” to “ok” to even “cool”, it spread – not everyone of course, but to the majority. It was fun to see. Charitable – at Pro-Activity we try to support people who are doing great things where we can…..and we try to include as many folks as possible in also doing so……we even started a non-profit “arm” of the business years ago to address it. Like many projects, we’ve had our ebbs & flows with how much we could support it – but we know it’s important to what we do and who we are. I put the word out earlier in the week that we were going to host our first “fun-run” of the season and that the weather (first time in a WHILE) looked relatively inviting. Lo and behold – Saturday morning when I got to BaseCamp31 a solid group had amassed and runners of all ages and abilities were ready to run. Whether it be the group who was only doing a few miles, or the group that was doing an “Indian Run” (not sure if there’s a more acceptable name now – but back in the day that’s what we called it), or even the group of professionals who came out to get in a short (20 or so mile) run – there was sweat running down the many smiling faces – and it was a great energy. I got to meet a few folks who I’ve never run with, see some friends I haven’t in a while and even try to keep pace with said group of professionals (members of NJNYTC)….to no avail of course, but it was a pretty strong 10 miles nonetheless. Hr1 DONE. TY @RKleppsDPT @PranaPT @Jerry_DurhamPT @Cinema_Air @AlpineAthlete: conversation, stimulation, motivation. What can’t #Social do? Swim – last week I had a little bit of a breakthrough in the water. I was pretty excited about it……but then, this week didn’t back it up by finding a way to get in the water. The good news is – I know how close I am – just need to nail it down some. Run – as mentioned above – not my best week as far as miles – but the run on Saturday made up for it some. Was able to push the pace some while trying to catch the “fast guys” and my average overall was tolerable. Other – I’m in the phase of training now where the weight starts falling off…..I’m down about 10-12 lbs (depending on the day) and somewhere around 7 lbs off race-weight. The trick for me is to let that level off some for now – which means EAT! Which of course, doesn’t break my heart. Where I stand – If my data is accurate (which I think it generally is), I’m at about 61.5% of my previous best training state – which, if the rate of improvement follows the line I’m on (no injuries, major setbacks, etc) should at the very least put me around 10% above that level and as much as 30%. I have no idea what that translates into as far as time-shaved, but if I can toe the line 25% stronger than I was in 2012, I think I’d be happy.